Bowies large enough to suit Crocodile Dundee were common on the American frontier but are much harder to find now. Today, if you're shopping for a Dundee knife, you might have to settle for a cheap movie replica or something practical but smaller. Fortunately Down Under Knives, a knife company from Australia, makes the real thing. You'll find it hard to distinguish their Outback Bowie from the knife Mick brandished in the urban jungle of New York City. The styling of this fixed blade of high carbon 440C stainless steel matches the details of the movie blade including the upswept point, false upper edge, and blood groove. Brass pommel and blade guard bracket a grip made from African ebony and stacked leather spacers -- a construction similar to Ka-Bar's classic Marine knife but better looking. Durability counts in any real knife, and the dual temper of the Outback gives the spine and tang of this hefty outdoorsman's knife flexibility and shock resistance along with a long-lasting and harder cutting edge. Down Under Knives warrants the knife against defects in workmanship and materials for five years, and in spite of its good looks, the Outback is built tough enough to withstand heavy use. Sixteen inches long and 6 mm thick, the Outback Bowie provides 11 inches of cutting edge -- enough to impress friendly New Yorkers and many others. Twenty-eight ounces gives the knife chopping ability as well, so when you strap the Outback to your belt, you can safely leave the axe at home. 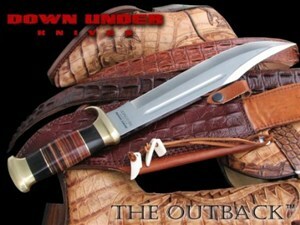 Down Under includes a genuine leather belt sheath with a crocodile-skin pattern. A sharpening rod also fits in the sheath, attached to a rawhide loop with ornaments of real bone. See the Panther from Mad Dog Knives for a Dundee-style Bowie built with tactical quality.